If you live in Baltimore, do you have electricity? In the wake of Friday night's violent thunderstorm, many Baltimore area residents and businesses remain without power, and trees still block major roadways. If you live in Baltimore, do you have electricity? 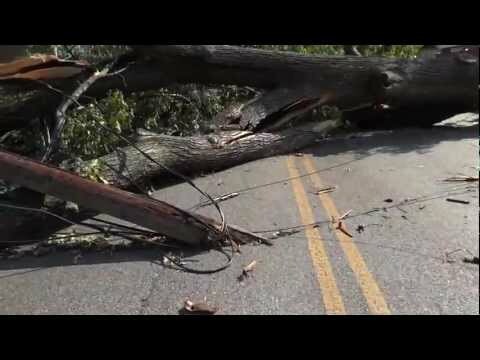 In the wake of Friday night’s violent thunderstorm, many Baltimore area residents and businesses remain without power, and trees still block major roadways. Today, we discuss Friday night’s storm, its aftermath and the cleanup operations. We’re joined bydirector of the Baltimore Mayor’s Office of Emergency Management Robert Maloney, Maryland Public Service Commission Chairman Douglas Nazarian, Montgomery County Executive Isiah Legget, Baltimore Sun weather blogger Scott Dance, Chesapeake Climate Action Network director Mike Tidwell, Baltimore City Health Commissioner Oxiris Barbot, and vice president of corporate communications, marketing and community relations and chief communications officer for BGE Robert Gould.